The easy, affordable way to protect your Program investment! Missing a Program is bad enough. Losing the money you paid for your Program is even worse. 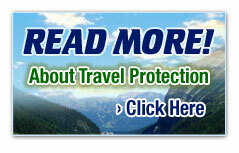 The American Trails West Travel Protection Plan is your ticket to worry-free travel. Now you can protect your Program investment at a very affordable group rate -- take the peace of mind with you when you travel.